Over the course of two years, students explore a variety of Jewish teachings and practices and draw connections to their lives. Students are encouraged to ask good questions, find what resonates with them, open their hearts and minds, take greater personal responsibility, and live more intentionally. Doing so, they find deeper ways to connect to themselves, to each other, to Judaism, and to the world. All students learn to read, write and chant Hebrew and develop a basic vocabulary of key roots, words, and concepts. 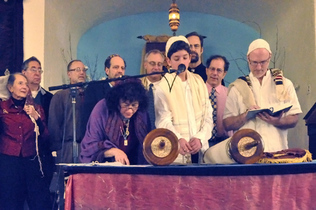 At the end of the two-year program comes the ceremony, where the student assumes the role of teacher, leading some prayers, reading from the Torah and sharing personal insights. Here students express their unique voices as they move into the next phase of their journeys.